I immediately warmed to Cara Dillon. As we made ourselves comfortable in our wooden ‘press hut’ set in the magnificent grounds of Sherborne Castle as she spotted that we had the same Orla Kiely iPhone cover. I knew then, that this is a lady with style and taste and someone you could have a good old girly chat with. However, we were here to chat about Behind the Castle. 1. As it’s the first ever Behind the Castle festival, what was the first ever festival you played at? It was a folk festival in the Scottish Highlands. I was 15 and my best friends from school and I had been doing some sessions back at home in Ireland. We were invited to pull a band together. We didn’t even have a name. So, we called ourselves ‘Óige’ which means ‘youth’ in Irish. It was a big first all-round and we got the festival bug from there. 2. What’s your thoughts on Behind the Castle so far? It’s very civilised. There’s homemade cake, proper coffee and bean bags. We do a lot of travelling, so it’s great to have a few home comforts. And the kids can run around the fields with no worries. 3. So, since that first festival you’ve obviously been to a few over the years, what would be your festival essentials that you wouldn’t leave home without? Piriton for hayfever, baby wipes – I have twin boys and a girl, a good pair of sunglasses and some wellies of course. CBC – Cara’s twin boys Noah and Colm and little girl Elizabeth were absolutely adorable during her set, especially Elizabeth who constantly waved to her mamma. 4. How would you describe your festival style and most importantly what will you be wearing for your set. I live in Frome over in Somerset and there’s some lovely vintage shops which are a bit different. At a festival I love to wear vibrant colours. I’m torn between an orange or turquoise dress. Hmm, I’m going to go for the turquoise one. I couldn’t tell you who it’s by as it’s from a little stall in Rome. 5. What are your most memorable festival experiences? Glastonbury. The whole toilet experience is memorable for being bad! And a good one is playing main stage at the Cambridge Folk Festival. It’s a real fun, family orientated festival. 6. Now, if you could curate your very own festival who would you invite to play? Who would be your headline act? Kate Bush. I’m a huge fan, she’d be the headliner for sure. And maybe some world music artists. I’ve been to Womad and love how hypnotic the vibe is, the crowd really get involved. 7. What can the audience expect from your performance later today? Well, I have my new album A Thousand Hearts out which is very exciting. And I have a great band behind me with Niall Murphy who’s an all-Ireland fiddler, Luke Daniels on the box (or accordion), it’s going to sound amazing. They’re really tight. They’ll be a mix of light and shade, foot stomping and intimate moments. CBC: What Cara failed to mention was that on guitar is her husband Sam Lakeman (Seth’s brother). Camping or glamping? Glamping of course! Wellies or flip flips? Wellies. Where will we find you during the festival: moshing at the front, dancing in the middle, chilling at the back or at the bar? Chilling at the back. Posh loos or hole in the ground? After the Glastonbury experience, posh loos. Favourite castle? Oooh, Nunney Castle as it’s just up the road from me and has this gorgeous little moat. And finally, can you sum up Behind the Castle in 3 words? Hmm, how about: Relaxed. Beautiful. Civilised. CBC: Oh, and one more thing. Can I take a photo for my blog? Cara: But, I don’t have any make up on. (CBC: Not that the beautiful Cara needed it). CBC: You look absolutely fine. Well, let’s take a #selfie or #festifie and put a filter on it. Cara: Yes, that sounds great. 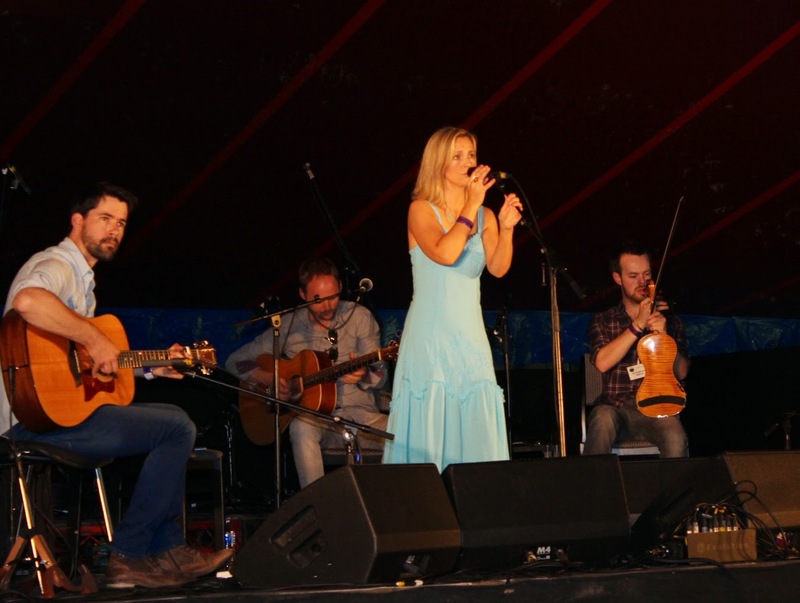 Check out my post from Behind the Castle festival here to read my review of the festival featuring the magical Cara Dillon. Watch this space for the rest of my Behind the Castle interviews. To keep up with all the Cara Dillon news and find out where she’s performing next, here’s all the key social bits and bobs you need.